Ray Bigler passed from this life in Edmond, Oklahoma on March 26, 2019 at the age of 91. A funeral is scheduled for Saturday, March 30, at 1:30 at the Strode Funeral Chapel in Stillwater, Oklahoma. He was born on August 26, 1927 in Stillwater, Oklahoma to Jacob F. and Celestia (Burton) Bigler. He married the love of his life Vera Jacklene ‘Jackie’ Hammons on December 22, 1972. They were married almost 44 years. 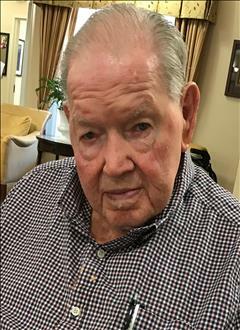 Ray joined the US Army and served his country during World War II in Japan. Ray was a businessman. In 1980, Ray sold his rental properties and he and Aunt Jackie moved to Costa Rica for twenty years. In 2000, they returned to Stillwater. He moved from Stillwater to Edmond in November, 2017, but he remained an avid OSU football fan! Go Pokes! Ray enjoyed coin collecting, reading and watching classic TV shows. He was predeceased by his parents and his wife. Also preceding him are siblings Clifford, Claire, Isabell, Ivo and Chester. To send flowers to the family of Ray Bigler, please visit our Heartfelt Sympathies Store.